With its strong commitment to providing each customer with the highest quality in packaging supplies and materials, Boomerang is a leading supplier of packaging straps. We offer a complete line of package strapping systems, strapping and strapping tools and accessories from the top manufacturers in the industry, including plastic strapping. Our expert staff will respond quickly to your requests, and provide you with an effective packaging strap solution to your needs. We are proud to work with a broad range of customers, from large international companies to small local businesses, and treat each customer with the same individualized attention. 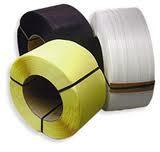 Boomerang's line of package strapping products is manufactured by the top manufacturers in the industry. Our staff works with each client to select the strapping system and products that will ensure that their products are protected and will be safe during shipping and storage. Our line of strapping and strapping equipment includes the following. Polypropylene strapping offers the greatest elongation of all strapping, and has good recovery of initial properties. It is very flexible and able to mold to the contours of odd-shaped packages. It is the lowest-cost strapping material, and provides effective, light-weight strapping for many applications. It can be heat-sealed, eliminating the need for metal seals. Polypropylene strapping offers many options on size and strength and provides superior performance for light to medium strapping applications. Polyester strapping has many of the strength characteristics of steel strapping, along with excellent retained tension properties. These properties make it a good strapping material for loads that require heavy duty tension around the load as it settles and shrinks in size. In addition, polyester strapping can be heat-sealed, eliminating the need for a metal seal on the strapping. It does not rust or stain, reducing potential damage to the material it is binding. And, this strapping is a green product, as it is fully recyclable. Boomerang carries the full line of Signode’s high performance strapping. Boomerang offers a full line of seals and buckles to ensure that your strapping stays tight and secure throughout the entire shipping process. The seals are designed to be applied using automated and semi-automated strapping machinery, or using hand tools. We offer seals for metal and plastic strapping and buckles for hand strapping on plastic strapping. Signode seals and buckles are designed to provide superior binding for all their strapping products. We offer a full line of automated and semi-automatic power strapping machinery and hand tools from Signode, including standard and large frame machines to handle most sizes and types of packages. 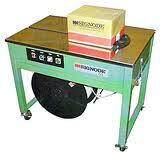 Tabletop and side-seal machines are available in standard sizes. Custom arches for unusual package sizes and specialty options to handle unique requirements are available. Hand tools are used for metal and plastic strapping applications ranging from light industrial usage to high output industrial applications. Boomerang offers a full line of manual, pneumatic and battery-operated strapping hand tools. We provide tensioners, sealers, strapping tools and combination tools, including specialty tools to handle custom and odd-shaped packages. Boomerang Packaging is committed to providing every customer with the most effective packaging protection for their products. It’s all in our name- we work hard for you, so that you keep coming back- Boomerang!